Rumors speculate that the next generation Wii, called the Wii U will retail at $300. I think this is right on and Nintendo knows exactly what they are doing. Given the economy and the fact that these consoles are released every 4-5 years, they should not be costing us more than $300. I think Sony and Microsoft need to pay close attention to this. People are not going to pay $400+ dollars for their next consoles. I know I will not. Looks like both Microsoft and Sony are planning to release new consoles in 2013, more than likely in Q3 or Q4 just before the holiday season. There are tons of rumors floating around right now about both of these consoles but considering we are more than a year away from their release its too early to start spreading more other than their release dates. I do believe the current generation of consoles is nearing its life cycle as their tech specs are getting old. I am ready for the new versions and hope that this time around both Microsoft and Sony concentrate on two main things: 1) a system that wont break. We all know of the red ring of death from MS and Sony had their share of problems as well, including hacking. 2) Price. We do not want to pay $400 for a gaming machine. The Wii outsold everyone this generation and one of the big selling points was the $250 price tag. So don’t give us a blu-ray player if it’s going to add even $50 to a cost of the machine, blu-ray is out anyway, netflix/amazon/hulu apps are much more important. Video games bad for children? Wow, a motion at this conference to eliminate video games for children. Lets take a close look at the article from the Guardian and conference against video games. I have quoted the article and broken it out into pieces and then commented on the section. Overall, this article was poorly written and there is absolutely no research backing up any of the claims made…at least they didnt cite any research. My feeling is that these are the same people who wanted to ban Harry Potter. This is what people said about TV and comic books when I was growing up. I was pretending to be a star wars character and they thought that meant I was going to turn out crazy. Little did they know I would end up being successful in the corporate world then move on to get a Ph.D. and become a college professor. This is hilarious. If this was the best reason they could find why children shouldnt play video games their argument is pretty laughable. Also, they didnt even cite where this came from. What doctors? What study? More likely than who, children that just watched tv? “Psychologists have expressed concerns that playing some games make children more aggressive. Lets see, both of these statements are actually contradictory of the research on gaming and education. Did they look at whats really happening or just talk to a psychologist and teacher at the conference against gaming? And what games make children more aggressive? There are ratings on games. I would expect children to react differently to R rated movies than PG movies just as I would to a game rated M for Mature game. If we are talking about games rated M (17 year old+) then the conversation needs not to be about the games, rather about the parents letting their kids play these games. “Alison Sherratt, a teacher at Riddlesden St Mary’s Church of England primary school in Keighley, West Yorkshire, said her four- and five-year-old pupils spend their breaks pretending to “throw themselves out of the window of the play car in slow motion” and act out blood “spurting from their bodies”. This is call ‘boys being boys’ In kindergarten me and my friends used to build guns out of Legos and pretend to shoot each other just like they star wars, gi joe, etc. Oddly enough all of us turned out pretty normal. I think in today’s classroom I would be expelled from school for no tolerance. “Obesity, social exclusion, loneliness, physical fitness, sedentary solitary lives – these are all descriptions of children who are already hooked to games … Sadly there is a notable correlation between the children who admit to playing games and those who come to school really tired,” she said. There is a correlation? Please show us the study. There is NO correlation this is someone making up fake information. Overall, this article is pretty bad. I would love to speak the author or at least show them my take on it. I could actually show research that supports gaming in the classroom. We have a lot of research showing gaming can improve achievement (learning), social interaction, and increase student motivation. This article and conference from what I can tell did not speak about any positives, look at any research, and instead seemed more like a witch hunt. Maybe these teachers should focus more on teaching students to analyze, critique, and evaluate…or maybe they should learn to do that themselves? Game looks pretty cool – It’s called BrowserQuest. Browser based and utilizes HTML5. It reminds me of the legend of zelda for the n64. 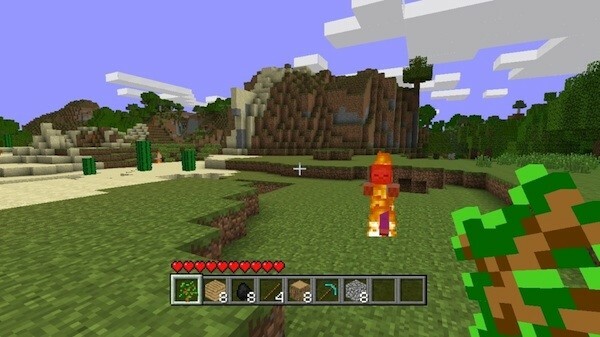 Minecraft coming to xbox 360! Very exciting news. This is one game that has been making its way into classroom across the nation. I will be using this game in my Gaming and Simulation class next spring! It will be on xbox May 9th for $20. I do think that price is a little steep though.